that will bring your entire body to a renewed sense of relaxation, comfort and vitality. organic essential oils, herbs and salts. 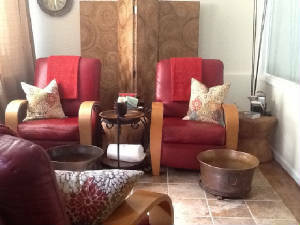 Relax with a scrub therapy, a acupressure foot and leg massage. Followed by a therapeutic reflex treatment to soothe your feet and "sole". special time to reconnect and celebrate. We can accommodate groups of 2-4 individuals for special events. Nourish, De-Tox, Soothe, Balance with pure organic products... creating wonderful results. a 45 min herbal soak and a foot massage. Re-energize from your toe to head with an mint salt foot soak ...uplift your spirit from"sole to soul" with pure organic oils and essences..
"Rest and Relax" Our signature therapy...Calm your soul and spirit with an herbal footbath and scrub. Relax and unwind with calming Bali Flower essences and a gentle rhythmic touch to release stress from your feet and tension from your body. Surrender to a mini tropical vacation! "Barefoot Ritual" For one or four...spend time with someone special, or enjoy this special therapy as well deserved personal time. Celebrate life, holidays, birthdays, anniversaries, transitions and events. Products vary with seasons and celebrations...we would be honored if you choose "the Barefoot" for your celebrations. Please notify your therapist of any health or medical conditions that may affect the sensitivity in your feet and skin to touch or temperature. consult to better provide you with personalized care. Reflexology is the application of specific pressure techniques, from a gentle energetic touch to a more direct (but always comfortable), pressure on the body, face, ears, hands, arms, feet and legs. Only your shoes and socks need to be removed to experience a deep relaxation and calm, a feeling of balance and centering, re-energizing and restored vibrancy. It is the most holistic of therapies...addressing the mind, body and spirit, improving health from general systems to very specific focus.. It brings together the essence of bio-energetic therapy, the touch of massage, and the focus of acupressure into a truly unique personalized experience. Clinical reflexology is not a salon therapy, but well researched modality, often thought of as "needleless acupuncture". Definitely a therapy to experience for reduce stress and restore comfort. A foot spa therapy with a focus on a foot health and reducing symptoms of injuries, diabetes, neuropathy, arthritis, and post-op recovery. Over 75% of Americans have foot problems...toe and/or toenail disorders, or skin conditions due to activity or diseases. Most are preventable with early detection and intervention. Products and therapy will be specific to needs, pain reduction and comfort management. Please also see below for additional medical foot care information. A holistic combination of reflexology, bio-energy and acupressure applied to the feet and ears. Includes an herbal foot soak. Remove only your shoes and socks to experience a deeply relaxing and healing therapy creating physiological and emotional balance. Especially helpful for general stress management and /or specific foot pain. Deeply relaxing therapeutic reflexology and bioenergetics, focusingon specific health concerns, stress, pain and comfort management, balancing physiology and specific areas of stress reduction. Includes a therapeutic foot soak and reflexology to ears, hands and feet. Also, helpful for specific foot concerns of arthritis, neuropathy, diabetes, plantar fasciitis, injury and post-op recovery. Clinical reflexology with the addition of hot stones, poultice, lazer, dry skin brushing or teshin therapy for a deeper intensity of care management. Includes a health history, review , holistic care plan and evaluation , as well as a therapeutic foot soak. Clinical reflexology with the addition of specific therapeutic essential oils and /or herbal remedies applied to the back, ears, arms and legs . Research indicates this reflex-zone therapy is effective to boost immunity, reduce stress, balance physiology, reduce inflammation and aids to detox the body. It is deeply relaxing and restores homeostasis of the mind and body. A light touch healing therapy combined with aromatherapy to focus on balancing energy, calming the mind and soothing the spirit. Reset and re-tune your intentions, your focus and healing goals. is the most efficient and valuable opportunity for individuals to receive preventable care and consultation for wellness. Foot problems can be the first sign of medical conditions such as heart disease, diabetes, nerve and circulatory disorders. As a nursing specialty, Judy, a foot care nurse will provide more than a pedicure. All foot care appointments include an overall wellness assessment, medication review, a comprehensive foot exam, monitoring of chronic disease symptoms, testing for sensitivity, nerve and circulatory changes, hygienic and prevention maintenance care, toe nail debridement (clipping, cutting or trimming), corn and callous treatment and foot and leg reflex- massage. 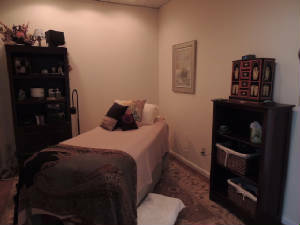 Appointments include an herbal soak and times may vary from 30-60 minutes depending on care required. Our skin is where our inner beauty meets the outer world and is more than our surface, it represents our whole health. Our skin is our largest organ, exposed to effects of stress, the environment, nutrition and hormones. Learn to support, nurture and maintain radiant youthful skin naturally with pure healthy organic products, rejuvenating acupressure facial massage and cool jade roller therapy. Chronic swelling of an extremity, joint or body region maybe a result of trauma, injury or post-surgery and may require a holistic approach to care. Touch therapy, nutrition, homeopathy, aromatherapy, elevation and compression maybe included as needed to maintain good skin and tissue health. After a comprehensive health history, evaluation and assessment of condition, a plan of care can be determined. Therapy may be focused to 30-60 minutes and/ or combined with additional modalities. A soothing massage to de-stress and promote an overall feeling of well-being. Gentle to medium pressure adjusted to individual areas of tension enhance circulation, improve muscle tone and induce a deep sense of relaxation. 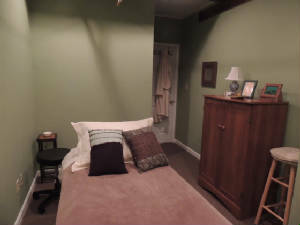 A deep tissue therapeutic massage focusing on specific stress and tension areas. Added pressure penetrates fascia and deep muscle layers to reduce muscle soreness and enhance muscle recovery promoting peak performance and relaxation. Luxurious deep tissue massage for relaxation and pain reduction. Especially effective for low back discomfort, chronic back pain and neck tension. For a warm luxurious deep tissue massage. Heated bamboo is used with organic oils to work through tight muscles to creating the benefit of a deep tissue experience without the discomfort of intense pressure. Let our healing hands reduce tension and increase comfort for the mom-to-be. The perfect relaxation therapy capturing quiet peaceful moments and reflecting on the miracle of pregnancy and birth. A combined therapy with two therapists including an herbal foot soak, massage, reflexology, moxibustion and acupressure. This therapy encourages the mom-to-be to relax, enjoy some personal quiet time, prepare for labor and reduce the possibility for medical intervention. It is recommended to schedule this therapy after the 39th week of pregnancy and especially after the 41st! This traditional healing therapy is designed to draw energy and disperse stress, pain and tension in specific areas. An herbal poultice is wrapped, steamed and oiled before applied directly to the skin as a spot treatment and incorporated into rhythmic movement. Take the poultice home for additional use. Wonderful for chronic pain, arthritic conditions and inflammation. Warm up with this thermatherapy from the wisdom of ancient healers. Warm river rocks are incorporated into the therapy to elicit soothing earth energy and promote relaxation.